What if it’s too expensive to buy a manageable switch but it’s still necessary to separate telephony from other traffic in a small office? Usually it’s typical to use smart switches that allow gaining control over the network with only a slight increase in the price of equipment. Although they are not as flexible as manageable switches, still, all primary abilities are available. 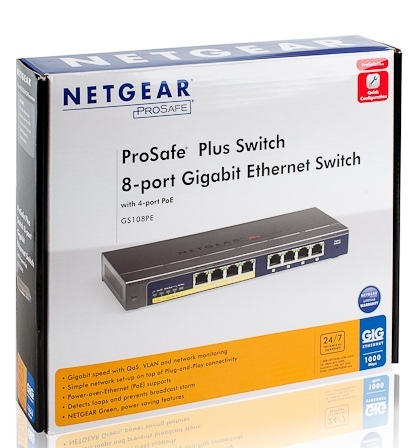 It’s just this kind of switch that NETGEAR gave to our testing lab – GS108PE with eight Gigabit Ethernet interfaces four of which support PoE (Power over Ethernet). NETGEAR GS108PE is performed in a metal case of the dimensions 103*235*27 mm and for its work it requires 1.25 A DC at 48 V voltage. The switch maximum energy consumption is 51.1 Watt. On the front panel there’re eight Gigabit Ethernet interface with their state light indicators, and a recessed Reset button for returning the settings to default and six light indicators depicting the switch power as well as power supply on PoE ports and PoE power overload. The ventilation grate is on the side wall. The top panel displays the vendor’s name and the switch series and model. The bottom of the device is equipped with four rubber stands and two holes for mounting GS108PE on the wall. Here there’s also a sticker with brief information about the switch. The power connection and PE are performed with the help of the back panel. Here you’ll also find a Kensington lock slot. The switch electronic filling is represented by a single board made of green textolite whose main elements are located on one side. 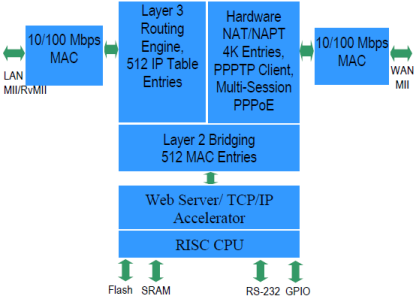 NETGEAR GS108PE is built on a Broadcom BCM53118KQLEG network processor whose scheme is presented below. 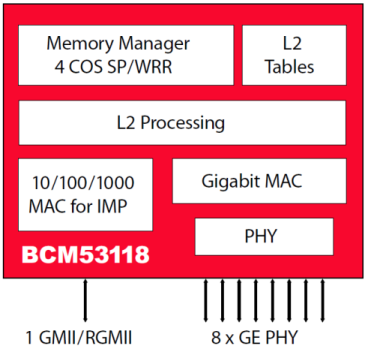 Flash-memory is represented by a 1 Mbyte EONEN29LV800CB-70TIP module. Perhaps, a Taifatech TF-480-ACL chip is responsible for limiting the transmission speed available to the user, for group broadcasting, for interface mirroring and protection against DoS-attacks. The scheme of this module is presented below. Now let’s move from hardware to software. The switch can only be managed with the help of a special utility working under the Microsoft Windows operating system. 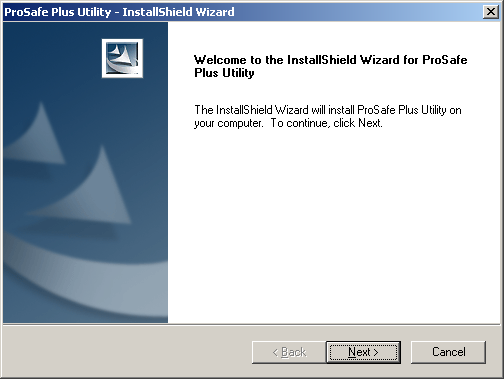 Its installation doesn’t require any particular skills, the only thing is that the installation wizard doesn’t support Russian – only English. 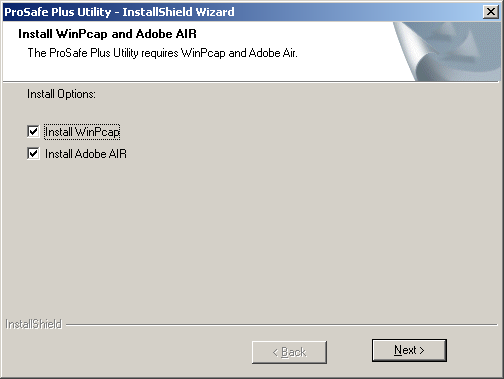 Besides the utility itself you can also install WinPcap software and Adobe AIR. The Prosafe Plus Configuration Utility interface is available in six languages and Russian is not among them. After detecting the necessary switch you connect to it by double-clicking on the corresponding line. When addressing a specific switch one has to enter a password which is by default – password. After entering a correct password you’ll see information about the switch interfaces, their statuses and speeds. Alas, the interface speed and duplex can’t be changed manually. 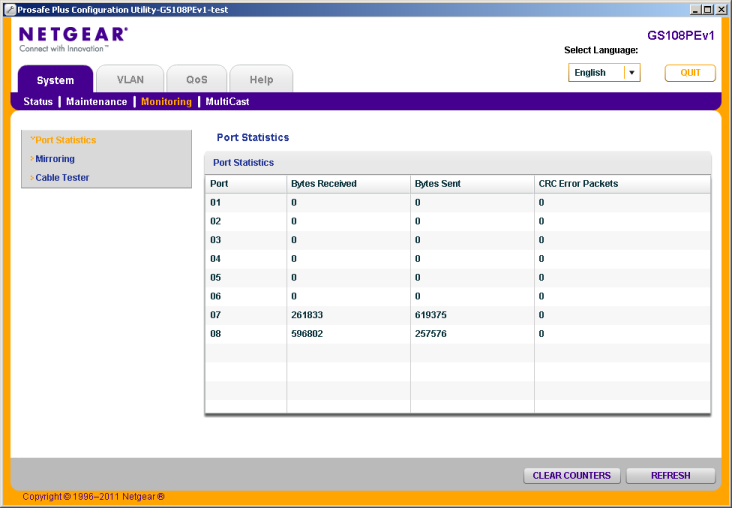 Prosafe Plus Configuration Utility has four main tabs: System, VLAN, QoS and Help. Each of them has additional sections with corresponding items on the left. Let’s briefly consider the abilities of several menu items. 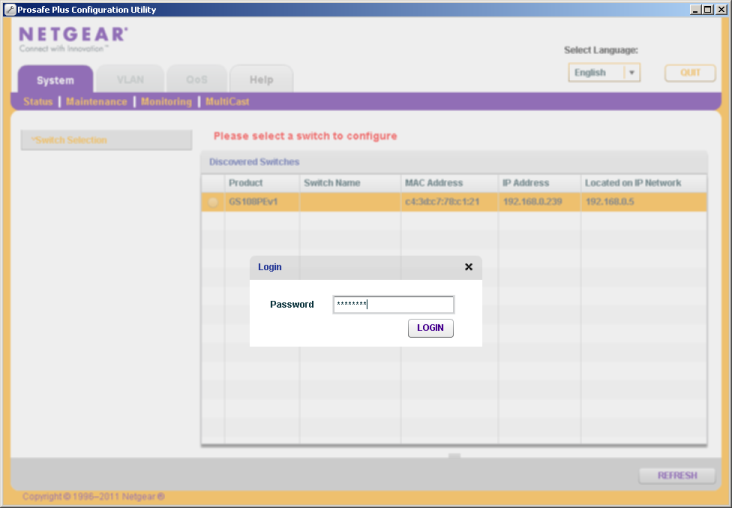 The Switch Information item in System-Status allows the administrator to access information about the switch model and name, the MAC-address of the controller, the firmware version and IP-parameters. 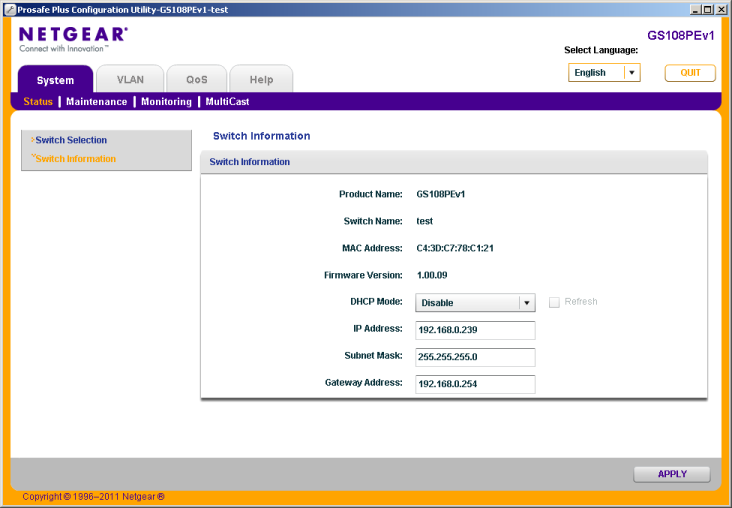 GS108PE can receive its IP-address, mask and gateway automatically or the administrator can set them manually. We wish we could also see information about the device uptime since last reboot. With the help of the Maintenance section the administrator can change the device access password, reboot the switch, update firmware as well as turn all settings back to defaults. 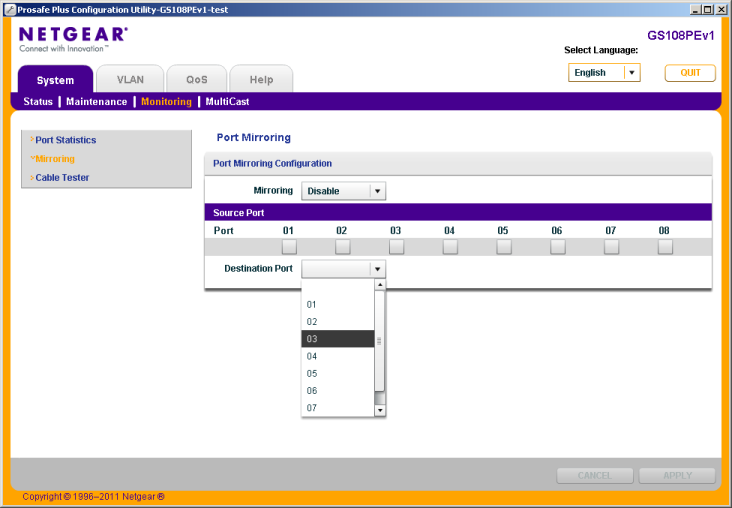 The Monitor section contains three items: Port Statistics, Mirroring and Cable Tester with the help of which the administrator can see the number of sent/received/error bytes for each interface, configure mirroring as well as perform a search for problems in the cable system. 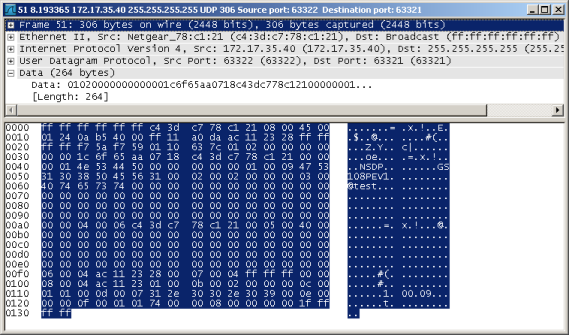 All settings of group broadcasting are gathered in the single item IGMP snooping of the MultiCast section. 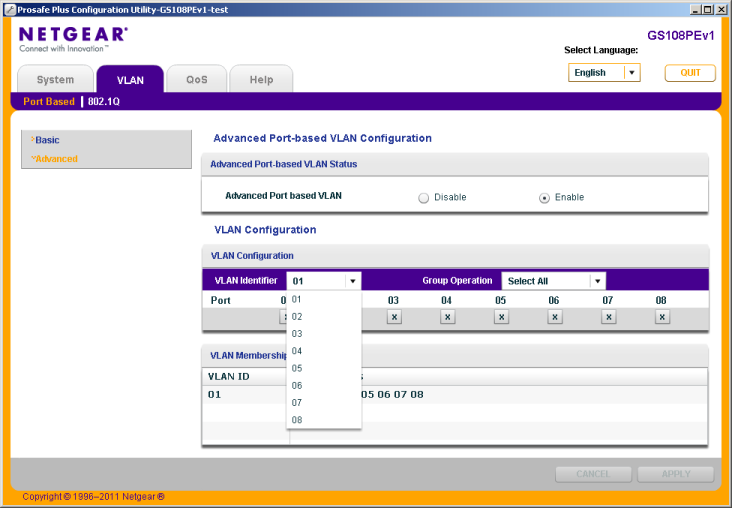 The VLAN tab contains two sub-sections: Port Based and 802.1Q allowing managing the device membership in different VLANs on the base of ports and the 802.1q protocol tags. 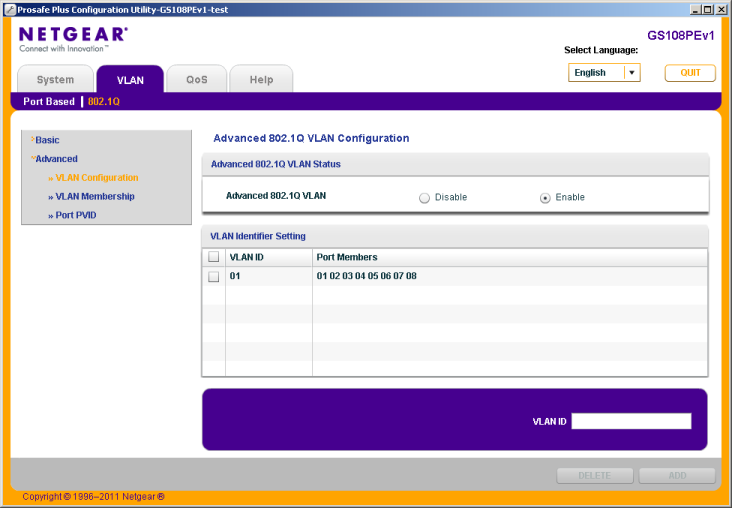 It’s worth noting that the 802.1Q item also allows assigning certain devices to specific VLANs based on the switch interface. Each sub-item allows configuring corresponding settings in basic or advanced modes. 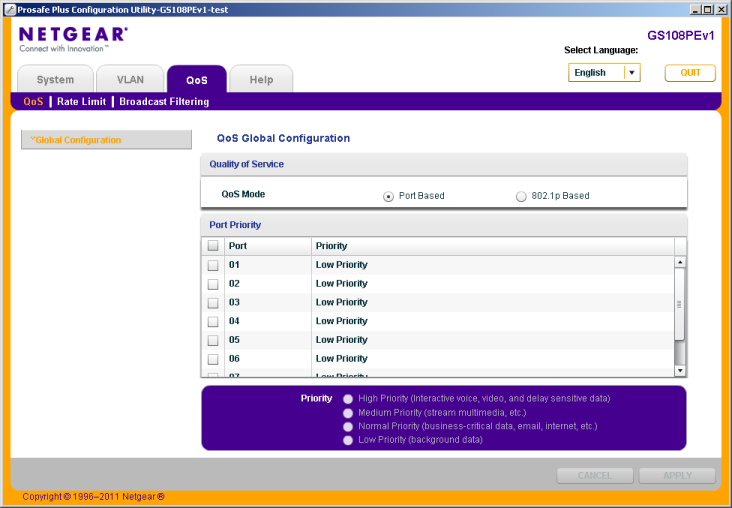 The parameters responsible for the quality of service are gathered on the QoS tab containing three items: QoS, Rate Limit and Broadcast Filtering. The former offers port and 802.1p-based prioritization. If necessary, upstream and downstream rates of each interface can be limited with the help of the Rate Limit item. 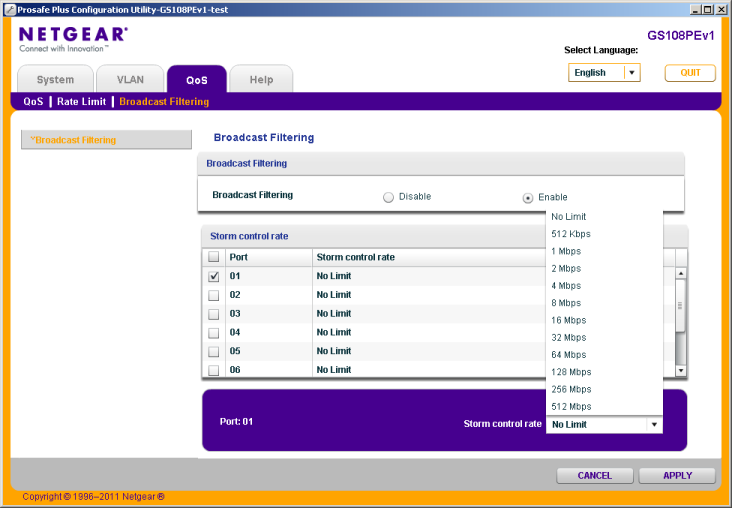 The Broadcast Filtering item allows specifying the rate of sending and receiving broadcast traffic for each interface. One can access user manual and information on the Help tab (User Guide and Support) from where the user will be redirected to the vendor’s web-site. Unfortunately, we failed to find a way to turn the switch port on or off with the help of the given utility. 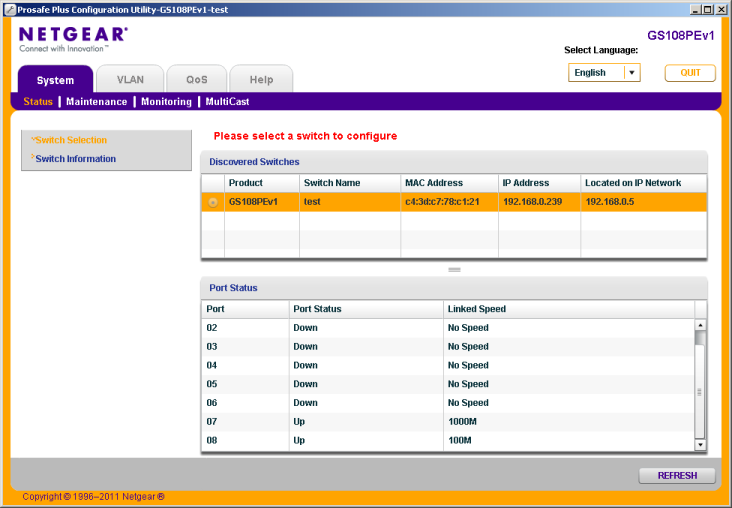 Such feature could be helpful if one of the PoE-devices connected to GS108PE hangs up or for blocking a user connected to a certain port. Also, we think it could be handy to have a possibility to switch off the built-in mechanism of protection against DoS attacks. Naturally, we couldn’t help spying on how the utility looks for switches. For this we took a Wireshark network analyzer. 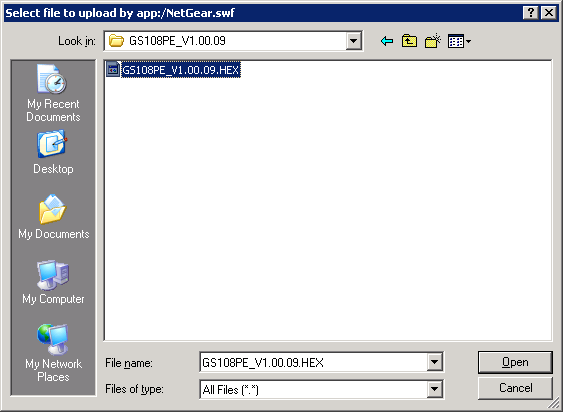 When searching the utility broadcasts a UDP-datagram from the port 63321 to 63322 to which GS108PE responds with information about itself. The thing that bewildered us most of all was the fact that the password is not only transmitted in plain text but is broadcasted. It means that you just have to be in the same segment with the administrator to get the password for managing switches! 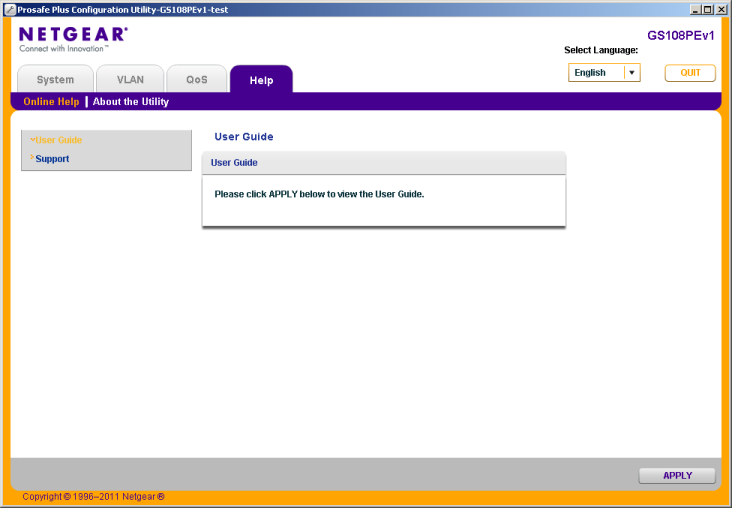 Here we are through with the review of the NETGEAR Prosafe Plus Configuration Utility and move on to firmware upgrade. To upgrade the GS108PE switch’s firmware you should use the Firmware Upgrade item of the Maintenance menu of the System tab of the utility described above. Here you only have to choose an image file with new firmware and click Apply. The whole upgrade process takes about two minutes. Traditionally we start the testing section with determining the device booting time, i.e. the time interval between switching power on and receiving the first echo-reply via ICMP. 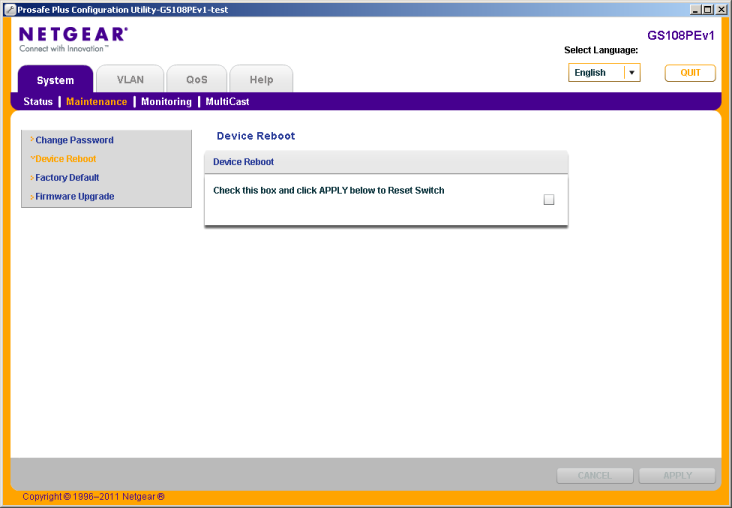 NETGEAR GS108PE boots in 6 seconds, which is a normal result for such devices. Among the switch’s claimed function was the ability to limit users’ traffic rate. There’re two main ways of limiting users’ traffic: rate-limiting or policing in Cisco Systems (www.cisco.com) terms and shaping. You can understand the difference from the diagram below which we took with some minor changes from the Cisco site. The rate-limit procedure demands less computational resources of network equipment, also it doesn’t require dedicated buffers for storing traffic peaks. However, shaping is more “humane” to the user’s traffic – it only delays traffic without losing it, which is more suitable for the majority of network applications. 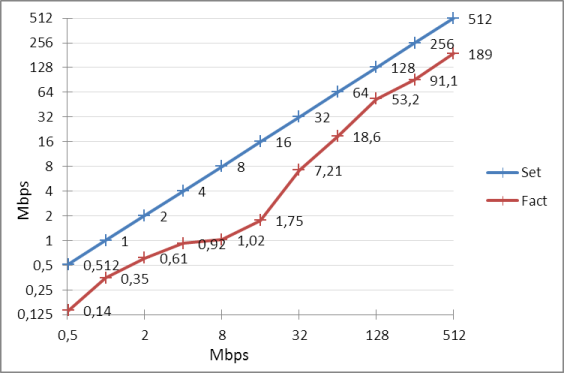 GS108PE allows performing rate-limit for speeds from 512 Kbps to 512 Mbps, doubling the limit at each consecutive step. Naturally, we couldn’t help trying this feature and are presenting a diagram comparing the limit rate with the real data transmission speed. To imitate a user data stream we used a Jperf 2.0.2 utility with ten parallel TCP-sessions. An increase of the number of simultaneous sessions allows making overall transmission smoother and even increasing the general speed. The obtained results of the measurements are presented below in a diagram and a table. The axes are logarithmical for the data to be evenly distributed. 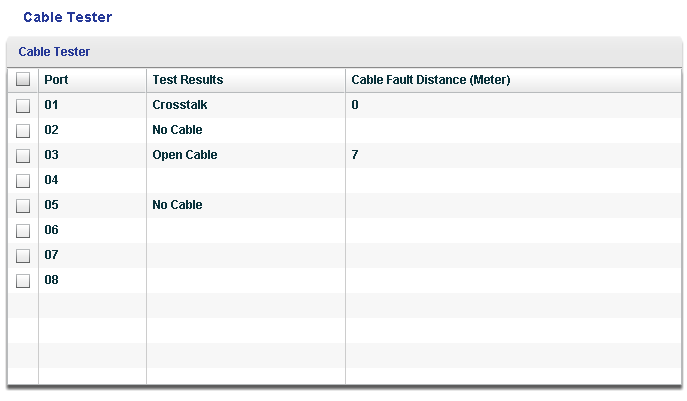 Also we decided to check the operability of the built-in virtual cable tester available in the Cable Tester item of the Monitoring menu on the System tab. We connected 1, 1.5 and 8 meter patch-cords to ports 1, 2 and 3 respectively and started the test. The tester completely failed even to detect short cables though sometimes it informed of a Crosstalk error for one of the patch-cords. The test result of the longer cable turned out to be more correct though the tester thought it was 1 meter shorter than it really was. On the whole the results of the test are satisfactory; the cable tester can be used as a means for express diagnostics of Structured Cabling. Now the testing section of GS108PE is over; let’s make conclusions. The tested switch NETGEAR GS108PE is an excellent solution for organizing a network for an advanced home or even a small office. 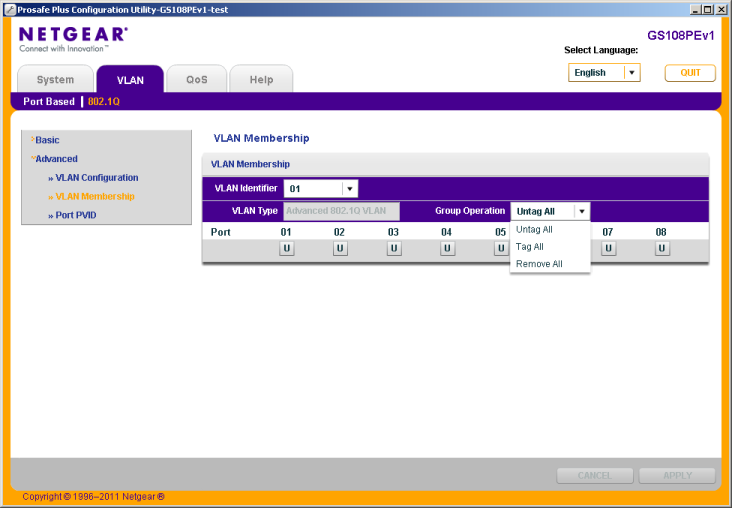 It allows uniting various users from fast computers to IP-telephones that can’t bear lags, whereas the VLAN support gives an ability to join subscribers into groups. Four PoE ports make the process of connecting telephones, access points and other low energy consuming devices extremely simple. The device advantages are listed below. The presence of a cable tester. Protection against loops and broadcast storms. Lifetime warranty from the vendor. NETGEAR GS108PE is only a smart switch, so you don’t have to expect all the power of a L3 or even a L2 manageable device; its functionality is rather limited. GS108PE disadvantages are listed below. The impossibility of connecting four PoE clients with maximum power consumption simultaneously. The absence of the Russian language in the interface of the management utility. The impossibility of turning the switch port on or off, setting its speed and duplex manually and to disable protection against DoS-attacks. Broadcasting a datagram with an explicit password. 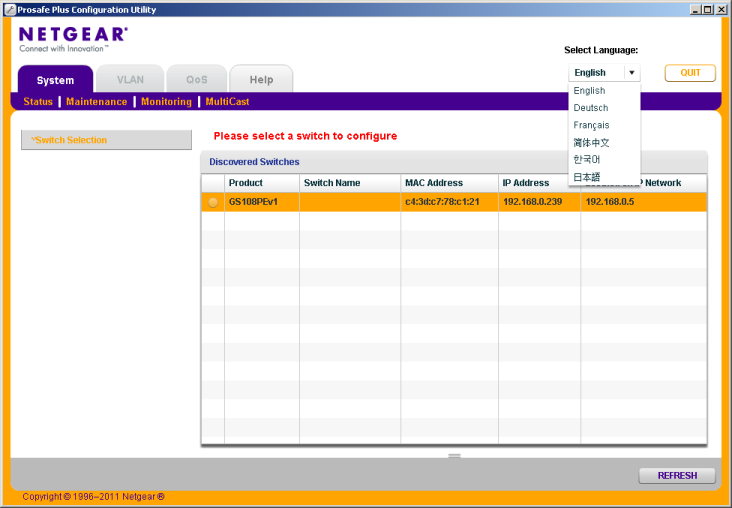 For managing the administrator’s host should be in the same broadcast domain with the switch. The controlling node should work under a Microsoft Windows operating system. When the article was being written the price for NETGEAR GS108PE in Moscow online shops was 4800 RUR.